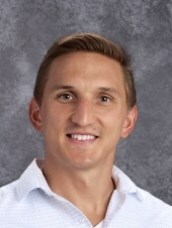 Ridgewood High School is pleased to announce Tristan Kumor has been selected as a finalist for the Golden Apple Awards for Excellence in Teaching. Golden Apple, a leading Illinois nonprofit committed to recognizing exemplary educators and developing future educators, today announced the 2019 finalists for the prestigious Golden Apple Awards for Excellence in Teaching. For the first time in the history of the organization, the award eligibility boundaries were expanded to include all of Illinois. Kumor has been a math teacher at Ridgewood for seven years. Out of 550 nominations, he is one of 32 high school educators to be selected as a finalist for this award. Being nominated by Ridgewood High School and selected as a finalist for the Golden Apple Award for Excellence in Teaching left Kumor honored. “I think being a finalist for this award speaks to how amazing the students and teachers are at Ridgewood High School. I think our school always strives to do what is best for our kids and I am happy to see that we are being recognized through this nomination” said Kumor.